"Another Dimension" features over 70 minutes of powerful progressive metal full of inspired performances. Fourteen new songs mark this release, recorded with singer Bjorn Lodin and drummer Eddie Sledgehammer. 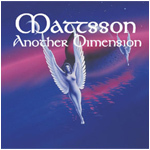 "Another Dimension" is jam packed with intense musical ideas influenced by classical music, classic hard rock, heavy metal and progressive rock/metal with a virtuso performance from Lars Eric Mattsson, including his best lead work ever. Shred fans will die for the duet showdown between Mattson and Rob Johnson on "Burning My Soul" -- absolute intensity! Erik Norlander - Keyboards on "Don't Chain My Mind"
Patrick Rondat - Guest Guitars on "Crash & Burn"
Rob Johnson - Lead Guitar duel on "Burning My Soul"
Par Lindh - Hammond solos and Mellotron. Ella Grusnner - Violin on "Angel Blue"